CHALLENGING ONE TOP TO BOTTOM ! Dragon character of Doritos is one of the though production cases. ! Where every bits of details demands extremely elaborated hard work from intricate labour of merging plush to wings or nails. Teeth are vacuum pressed, nails are 3d printed. We can be proud to declare that there is maybe no similiar one to be compared considering loyalty on original design and comfortability of acting. Not only best in Europe or Asia, you can check easily to see on your own eyes all mascot manufacturers, mascot producers, mascot making companies or mascot suppliers in the world, compare the obvious distinction, exceptional quality, high precision, artistic sensitivity in all details of our work of brand mascot design and manufacturing. Not only bare mascots but also amazing live, moving eyes and eye lids, fascinating special effects by swinging antennas, flapping ears, tails by either pre-programmed or remote control manners. 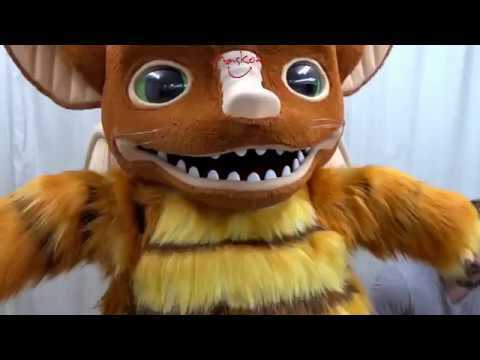 Technology is an essential issue in mascot character costume production in some cases involves high technology too. But it is actually collective dedicated team work that results in exquisite masterpiece mascots of individuals specialised on certain expertise. The quality is combination of many different aspects like ergonomy, lightness, air ventilation, ability and flexibility in action that all together can be considered as comfortability of use. We analyze, improve ways to enable animators in extreme acts beyond usual movements like walking, even acrobatic actions in some cases. We also feel responsibility to warn our customers if there is a point of problem in artwork or visual material they send, related to design. One of such issues is mostly about the place of sight of vision for animators which has a potential trouble when missed from attention. We are not open to any kind of surprises. The other one is artistic evaluation. In all kind of mascots loyalty to design, dedication to artwork is an unquestionable must. If we design the character we define personality profile with a text of reasons. İf we are given a character artwork or 3D design already settled we can serve you as a guide on your material. Our creative team has a background on character design especially. They focus on personality profile of each character, evaluate designs, make comments on even tiny details like a dimple or expression, offer revisions guiding customers when needed till approval. The best mascot production and service means an understanding gathering, forging so many values in a single vision and mission. We call it ultimate passion. It is natural that prices of mascots comes in a variety depending on degree of sophistication. And we clearly declare that we have the lowest possible price range for highest quality mascot costumes compared to price range. As a result of our experience for more than twenty years producing more than two thousand mascot costumes in a huge diversity we find out ways to ensure utmost ergonomic conditions to provide comfort for animators adopting unusual forms to human anatomy. This long period of time also inherits the story of evolution of materials and methods improved gradually within two decades. This is a list of qualities we haven’t been using even ten years ago. Honestly, most of them are not being used by any other mascot producer at all. This constant research and development is the reason why we are able to produce high quality mascots, any number of items in surprisingly short period of times. One issue we didn’t even deal with is to be punctual on delivery. We had no such trouble in our history of almost a quarter century. It doesn’t matter which country you are located. We will be in your service if you have at least three weeks time to get your mascot costume for your event just contact us !. All you need to do is sending your visual materials us. We live in an era of communication. We share not only images, also videos of stages of production, getting your comments about 3D design, sharing revisions till we get your approval, alternative samples of fabrics, fur, plush samples for your approval. We can also have phone conversations, live skype sessions when required. We keep in touch until everything is setteled finally your mascot is approved and ready for shipping. © 2019 MASKOT • ALL RIGHTS RESERVED!